The Lipman Nurit 2085 Credit Card Terminal is a compact and flexible credit card processing machine. You can even customize the Nurit 2085 for increased efficiency. 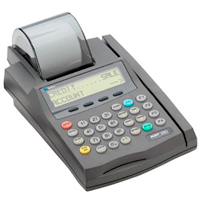 The Nurit 2085 credit card terminal is one of the most popular and reliable in the industry. The Lipman Nurit 2085 provides everything you need from your credit card terminal. The menu-driven display of the Nurit 2085, combined with its 4 “soft keys” and 4 “hot keys”, make using this unit fast, customized and efficient. The Nurit 2085 built-in thermal printer ejects highly legible receipts at a rapid rate of 12 lines per second.